In an age of reality television and celebrity tattooists, David Bruehl’s work is a reminder of tattooing’s rich history as well as its depth as an evolving art form. 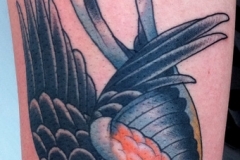 Simple bird tattoos become lessons in illustration. Large back pieces, studies in iconography. As tattoos become more mainstream, there’s a paradoxical demand for the image to become more commercial and easily reproducible while remaining an exhibition of uniqueness and individuality. 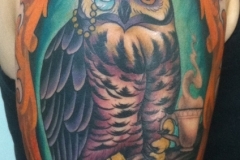 The overabundance of tribal tattoos (as one example) points to a specific supply/demand chain that requires minimal effort from both artist and patron, resulting in a kind of stock imagery that in some respects limits tattooing’s status as a serious art form. However, Bruehl’s work is singular. Every tattoo is a custom design and demonstrates a deep understanding of formal artistic elements—line, shape, color, rhythm, and balance. What emerges is not a “flash” image or impulsive decal, but a collaboration between his own aesthetic interests and his client’s need for self-expression. 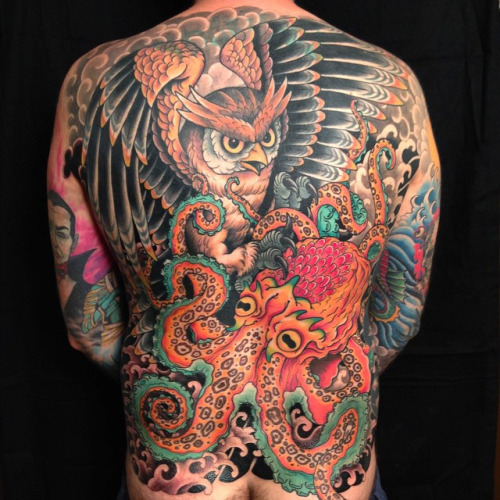 Born and raised in the Oklahoma City area, Bruehl studied illustration at the Savannah College of Art & Design before starting as a tattoo apprentice. 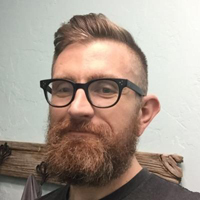 He now works at RedLetter1 in Tampa, Florida. 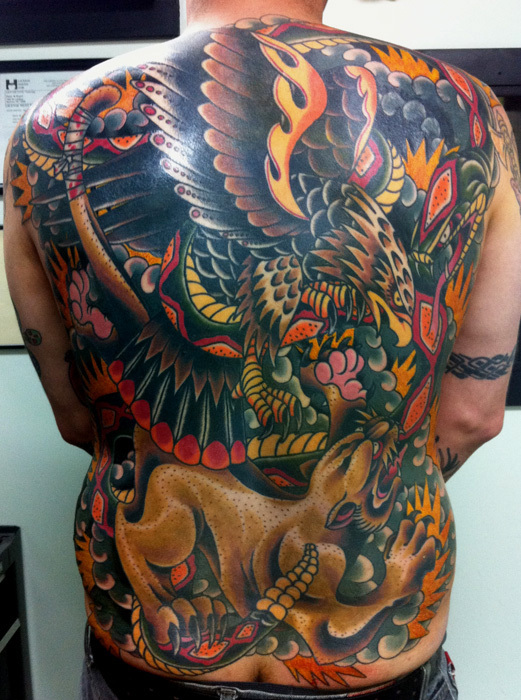 The Fiddleback: How long have you been tattooing? David Bruehl: I was definitely interested in tattooing when I went to college, but wasn’t necessarily planning on being a tattooist. I’ve been tattooing since mid-2001. I remember seeing some tattoos when I was a teenager. A couple people I knew had them. I can remember looking at a couple tattoo magazines during that time (which were horrible, quality-wise) and wondering why no one was doing anything better than what was in there. I definitely felt like I could do something with the form at that point. 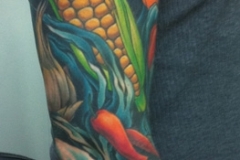 The Fiddleback: One of the things I find most fascinating about tattooing is that it’s a cross between pure artistic expression—that is, art for the sake of creating—and commercial art that is almost exclusively market-driven. How does this influence you as an artist? Does working directly with people give you a welcomed sense of collaboration, or do you find it frustrating to navigate? DB: There are both aspects for sure. I like the way that collaboration can draw things out of me that I may never make or explore on my own. Sometimes, depending on the situation, though, it can be stifling. The way I describe it to people interested in learning to tattoo is like this: Say you have this great idea of something you want to tattoo. You can’t just up and express yourself like with a painting. You have to find someone to get the tattoo, and they have to be able and willing to stick with it until the end. I know a lot of really talented people who finally got out of tattooing due to that lack of control. It definitely takes a lot of energy to work with people constantly like that. The Fiddleback: Tattooing has a rich history and can be charted as far back as the Neolithic period (9,500 BC). Irezumi, the Japanese art of tattooing, was widely practiced as a high art form as early as 1600. How important are historical movements to your personal aesthetic? Do you feel you’re part of an ongoing conversation? 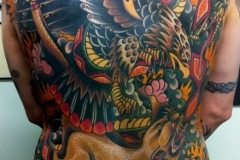 The Fiddleback: Tattooing, like most artistic disciplines, is divided into genres—traditional, new school, Japanese, portraiture, etc.—that each incorporate their own iconography. Given your work is very eclectic, would you say you’ve been influenced by several styles? Which artists, from any field, have most influenced your work? [Skin is] probably the most inconsistent difficult surface one can work with. It’s like working on paper, but every piece of paper has a different texture and elasticity, and must be stretched to make a mark on it, plus it may be moving. DB: I’ve formed a specific philosophy about this. I think that tattoo genres each have something unique to offer and learn from, so I utilize all to create my own work. If anything, that’s why my work may look eclectic. I will say as time has gone on, though, that I’ve relied more and more on my own instincts and so my work has become more cohesive looking as time has gone on. 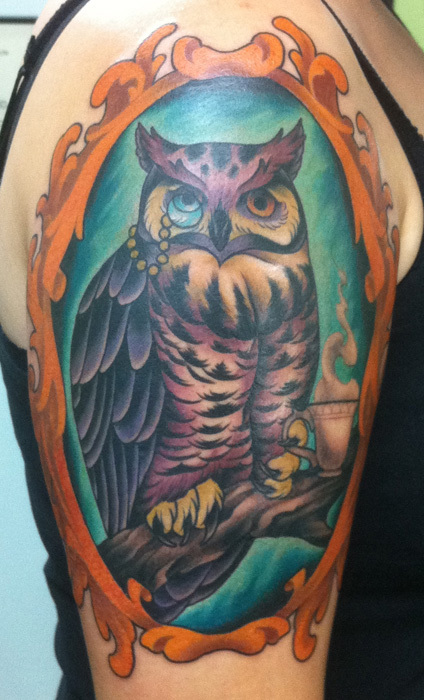 Artist-wise, Grime was probably my most major influence in tattooing. Equal to him, I’d say, is my good friend Jason Vaughn. I’d credit a lot of my development to working with him. 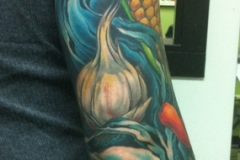 Outside of tattooing—Ernst Haeckel, Alphonse Mucha, Joe Sorren, Jeff Soto, and James Jean have all been really big influences, though I draw a lot from folk art as well, outside of specific people. 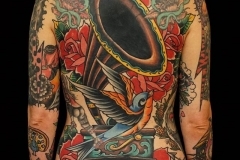 The Fiddleback: In the last thirty years, tattoos have become much more mainstream and prevalent even among white-collar society. More recently, shows like Inked, Miami Ink, and LA Ink have brought tattooing into the realm of reality television. 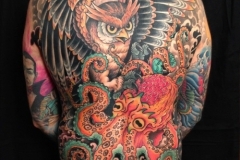 Do you think that the current popularity of tattoos simply means more business for artists and a greater appreciation of the craft, or has it taken a discipline and reduced it to spectacle? DB: There’s not a simple answer to that. I think tattoo shows have increased the popularity, but have also perverted the form in a lot of ways. Without a doubt media has used tattooing for entertainment value without doing it in an intelligent, respectful manner. I doubt that we’re unique in that, though. I’m sure that other crafts that I’m not familiar with are misrepresented through their own reality shows as well. If anything it’s opened the doors for a lot of people to explore tattoos, and with the internet and such, to seek a much higher quality of work than what they could get in the past. 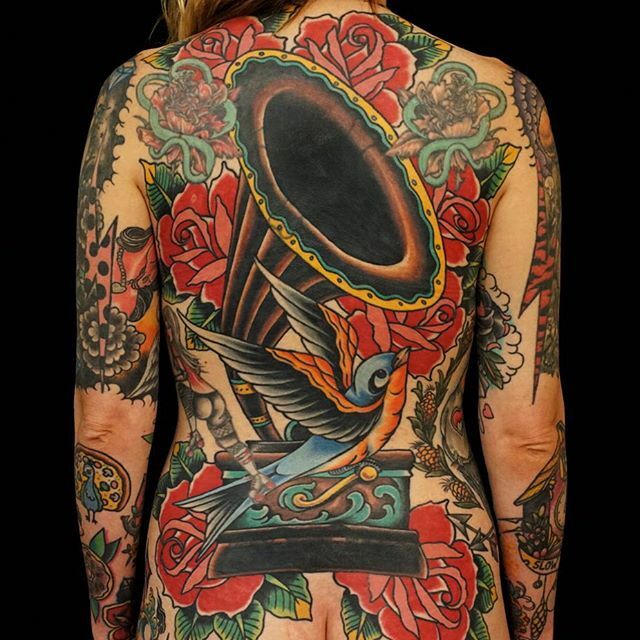 The Fiddleback: I think it’s cliché and simple when folks ask tattooists what it’s like to work with skin as their canvas, and at the same time I’m interested to know what it’s like to work with skin as a canvas. DB: Probably the most inconsistent difficult surface one can work with. It’s like working on paper, but every piece of paper has a different texture and elasticity, and must be stretched to make a mark on it, plus it may be moving etc. I can’t complain, though, those sort of challenges are part of what keeps me engaged. The Fiddleback: Describe your ideal client. DB: Someone with good basic ideas who will defer the final design to me and trust my judgement. Also someone who I can talk to, staying engaged in interesting conversation. DB: No, because even in those situations, that’s still not free-reign. I need to take into account that person and their own interests and boundaries even if they want me to do whatever I want. The Fiddleback: In addition to tattooing, you also paint, watercolor, and design custom prints. Are there other projects you’re interested n pursuing? What can we expect from you in the next five years? DB: I do a lot of physical stuff, kettlebell sport and all that. I needed some kind of physical hobby to counterbalance the creativity and craft, so I’ve been working a lot on all that. I’ve been focusing on watercolor, working on larger and larger pieces. I suppose I’d like to have a serious solo show in the next five years. I’m just working to the point where my watercolor work and my tattoo work are nearly indistinguishable in approach. That’s what’s most important to me right now—being true to my own instincts and vision, unrestricted.